so before you know it, you’re paying $75 more per ticket. Really creates a bad vibe! That sounds bad. At least Ryanair lets you check-in and print your boarding passes 30 days prior to departure so it’s not really a hassle as long as you know of the requirement. 24 hours could be a problem. We’re often in places without access to a printer the day before our flight, so it’s good to learn about Frontier’s M.O. now. Surprised they didn’t charge you to talk to a rep, though. This is a real pain if you’re traveling. Good idea to make sure your lodging will give you access to a printer the night before a flight! I just booked an Easyjet flight for later this year and noticed you can check in up to 30 days ahead, and it seems they may not have check in desks at all anymore – there was a note about dropping off checked bags AFTER security. Yes, for long distance trains it really pays to book ahead these days. I’m paying less for an ICE in Germany, bought ahead, than I will for a regional that only has one price! A bus might be cheaper, but the bus station is less convenient and I much prefer trains. Actually, by the time you add in all the add-ons, planes aren’t always that cheap. Agreed. Flights aren’t always, or even usually, your cheapest option. It’s still surprising to me that they’re ever the cheapest option. And yet sometimes they are. Even in Vietnam we flew from Hanoi to Da Nang and then again to Ho Chi Minh City for less than the price of the train. When we told a couple of young backpackers that they could have skipped the 17 hour train ride and saved some money they almost cried. Lol! But didn’t that long train ride also save a night’s lodging? And I had some interesting encounters with locals on Vietnamese trains. Yes, so very very very true! Good tip. The budget airlines actually make it harder to compare prices. What looks like the lowest fare may not be the lowest fare once you add in all the extras. Before booking a flight we always go and research baggage fees etc. to make sure we know exactly what we’re buying. 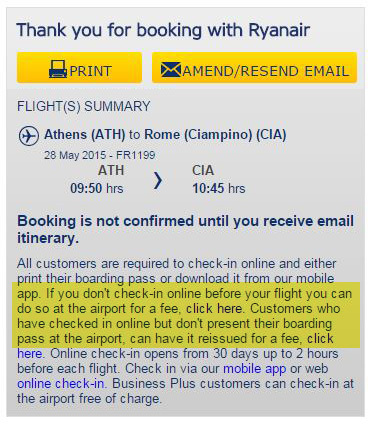 Athens to Rome for €38 – wow. Almost worth travelling Ryanair LOL! Very good post. I imagine a lot of travellers from further afield are unaware of Ryanair’s tricks. Thanks for the reminder. So often, we are excited about our plans and forget to notice weight limits, bag limits, check-in procedures, etc. Unfortunately, these types of “gotcha” revenue schemes will only tarnish the travel industry (or any industry) and the brands of the specific airlines over time. If there is a more up-front, trustworthy competitor, we will go with that good reputation instead. Call it “voting with your seat”.